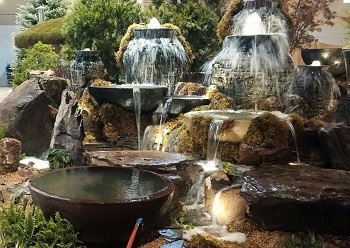 If you’re looking to add a splash of water to your outdoor space, but not quite ready for a pond or waterfall, then a fountainscape from Nature's Re-Creations is perfect for “testing the waters” in your outdoor space. Listen to the gentle sound of running water in your garden or landscape, while enjoying the beautiful view of your outdoor water feature. Fountainscapes are water features, large or small, such as bubbling rock fountains and spitter fountains, used as decorative elements in your landscape. Some can incorporate in-ground reservoirs while some don’t require any extra components to function. You can incorporate plants in a variety of different shapes and sizes to complement your water feature’s visual appeal. Fountainscapes look great by front entrances of homes to greet visitors, tucked in gardens as accent features, placed along paths and positioned on decks or patios to enjoy during the daytime or evening. Depending on style, fountainscapes, can be easily installed in just a matter of hours. Work with your local Certified Aquascape Contractor to help choose the right fountainscape for you landscape that fits your budget and style. To learn more about fountainscapes in St. Louis, contact Nature's Re-Creations today at (636) 223-2330. © 2015 Nature's Re-Creations. All rights reserved.